In February 2008 it was my privilege to serve as a member of the CrossFit HQ team that traveled to San Antonio, Texas, to work with members of the Warrior Transition Battalion from Brooke Army Medical Center. We learned important lessons about the human and technical aspects of working with athletes with catastrophic injures. Be quick to listen and slow to advise—It will take time to establish trust and a rapport with each athlete. It’s highly likely that each individual has seen multiple doctors, specialists, nurses and occupational therapists. They will be skeptical of additional “help.” A trainer will have to earn a warrior’s respect. Don’t push athletes who aren’t ready or willing to gain or re-establish real-world work capacity. Be creative, resourceful, and flexible with programming efforts—No one-size-fits-all workout formula exists. Each injury is unique in scope, scale and magnitude. Some athletes will have multiple injuries. In group settings, it’s highly probable that a prescribed workout will have one or more modifications for each participant. 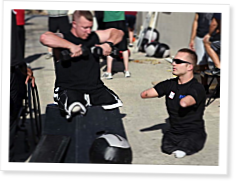 As a community, CrossFit emphasizes that the physical needs of athletes differ only in degree, not kind. Universal scalability of basic workouts and modified movements are acceptable parts of an athlete’s journey. Working with combat-wounded populations is no different, although additional time, care and attention must be devoted to those with catastrophic injuries. Improved prosthetic technology and user-driven innovation are opening new avenues for adaptive athletes who refuse to accept limitations. I had a great time at the Milwaukee Certification. You and the other trainers were great and I loved every minute of it. Great article. It is the ethos you exude at every workout and event whether you are participating or coaching. It is truely inspiring to see these athletes regain confidence and sense purpose that CrossFit has brought to them through all the coaches that participated. In the giving, so much more has been returned. We will miss your mentoring at Quantico CrossFit as you move on to new horizons. Fair winds and following seas. You were at my cert in January At GSX, I cannot thank you enough for the knowledge spread, It was an honor and a pleasure meeting you! Im sure our paths will cross once again in this great community. Hope all is well with you and your Family. Im leaving Ramstein Germany, Im headed to Osan Korea! if your ever in my neck of the woods or need anything from my side dont hesitate to ask! "grabbing life one WOD at a time and sometimes two"
This article really hits home to me for another population, with somewhat similar (not usually as catastrophic) difficulties - the elderly. Most Boomers and their parents may have had some physical activity as children, but it's been a long time. They don't know *how* to make a movement happen, even if they can visualize it. The individual assessment, working in small groups, willingness to step back and regroup, and progress in little things matter here, too. Something as simple as hopscotch, progressing to a laid-back dot drill, is huge for their belief in their own mobility. Results drive the belief in the possibility of regaining function, vice losing more of it. Thank you for all that you have done for the community. This is just another chapter in the lasting impact you have on everyone you touch. Just came across this article now, and it reminded me that this thing we do is for life and not just prepping for combat. As a nomadic Marine CrossFitter, your name comes up EVERYWHERE I go for a workout. I still remember when I had first emailed you about coming out to CFQ while I was injured at TBS and how you called me on the phone instead of replying by email. I was shocked to be on the phone with a Major, let alone one who was calling me dude! Without your example to follow, I never would've been able to put together the 2 day CrossFit familiarization seminar for the 53 Lieutenants of the Infantry Officers Course 2-10. Without your success with CFQ to point to as a model, Ramer Hall Combat Conditioning Facility at TBS would still be cluttered with Hammerstrength machines. Now there's functional movement space, a 12'x6' pullup apparatus, bumper plates and high quality bars, plenty of dynamax med balls and even a brand spankin new Reverse Hyper Swing!!! Keep up the great work spreading the gospel in the Corps and I will try to uphold your example. It's an honor to have spent some time Wodding under your keen eye.